SCR8 DORSEY-COLOMB ROADS/HIGHWAYS - Requests DOTD to study improving operational safety of exit from I-10 to East Washingon Street in Baton Rouge. SCR9 DORSEY-COLOMB ROADS/HIGHWAYS - Requests DOTD to study widening and lengthening the I-110 on-ramp from which traffic coming from the state capitol enters I-110 north in Baton Rouge. SCR61 TROY BROWN TRANSPORTATION/DEV DEPT - Requests DOTD study widening LA 73 in Ascension Parish. 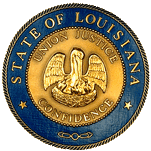 SCR70 TROY BROWN TRANSPORTATION/DEV DEPT - Requests DOTD study four laning LA 73 between LA 30 and I-10 and four laning LA 30 between I-10 and LA 44, all in Ascension Parish.